Please call owner Pete at 262-536-4236 or 847-840-5213. Boat Location: Port Washington, Wisconsin. 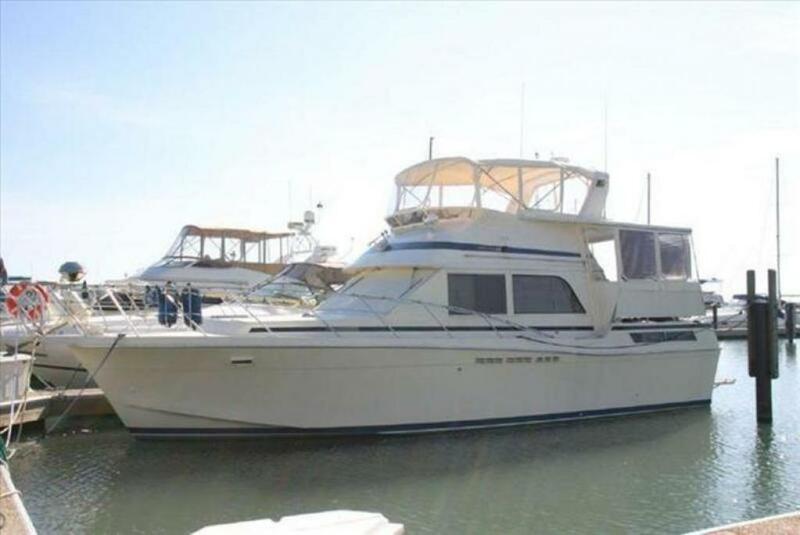 New STAMOID canvas, new radar, new autopilot, Garmin chart-plotter, fuel-flow meters, search light, 300' anchor rode, holding tank level gauge, 2 electric heads, air-conditioned heated, range, micro oven, flat-screen TV, refrigerator, freezer, ice-cube maker, 2 showers 1 full bathtub, synthetic non-skid teak in heads, on after-deck bridge deck, synthetic wicker furniture on after-deck, generator, always in fresh water Lake Michigan, tender outboard available. Engines total hours approx 800.